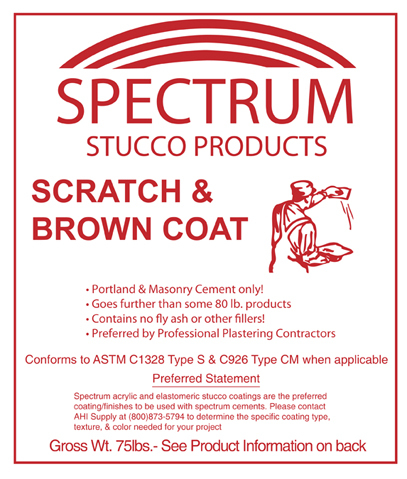 Spectrum Scratch & Brown is a dry - reinforced product designed to be used as the scratch and/or brown coat in a three-coat stucco application. Tremendous steps were made by AHI to develop our Spectrum Scratch & Brown coat. Our company has received a large number of glowing reviews on this product. Installers across the country that have used our Scratch & Brown have stated that our product has “superior coverage”, “better board life”, “does not dry out as fast” and “stays on walls and ceilings without falling to the ground like the one coats or other competitive products” they have used. Application of Spectrum Scratch & Brown will help resist water penetration, plastic shrinkage, cracks and sagging. It will also produce a non-load bearing, aesthetically pleasing exterior or interior finish on concrete, masonry and stud walls or metal buildings.